Tour Peru is a legally established Peruvian bus company with over 20 years of experience offering transportation services in Peru and Bolivia. The company operates some of the most popular tourist routes in South America: Cusco, Arequipa, Puno, Copacabana, Juliaca, and La Paz. 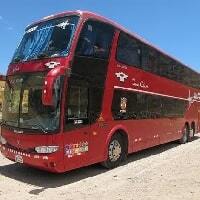 Tour Peru works with lie-flat buses (seats recline to 180 degrees) and semi lie-flat buses (seats recline to 160 degrees). The routes Tour Peru operates can be seen in the Routes & Schedules tab.